Borealis, a leading provider of innovative solutions in the fields of polyolefins, base chemicals and fertilizers, has signed a contract with Navigator Gas for the long-term time charter of the vessel Navigator Aurora. The naming ceremony took place at the Jiangnan Shipyard in Shanghai, China, on 3 May 2016. The vessel was christened by Irene Giner-Reichl, Austrian Ambassador to the People’s Republic of China. After its commissioning in the fourth quarter of 2016, the new vessel will be the world’s largest ethane carrier. The agreement plays a crucial role in ensuring the cost effective, safe and reliable transport of ethane to Borealis production facilities in Stenungsund, Sweden. Borealis has entered into this long-term time charter agreement with Navigator Gas, owner of the Navigator Aurora and operator of the world’s largest fleet of handysize liquefied gas carriers. With a length of 180 m, the newly-built Navigator Aurora has a total cargo tank size of 35,000 cubic metres (cbm) and can hold ethane loads of up to 20,000 tonnes, making it the biggest ethane-capable vessel serving the global market. Commercial operations are scheduled to begin in the fourth quarter of 2016. The vessel will sail between the Marcus Hook refinery in Pennsylvania, US, and Stenungsund. 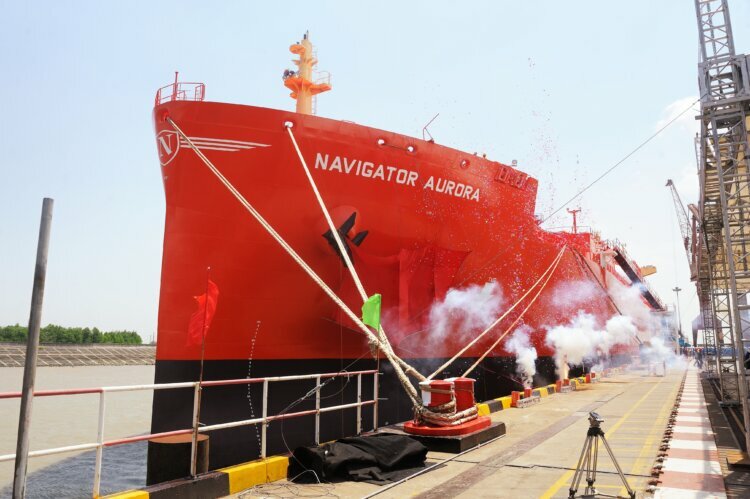 As a dual-fuel vessel, it can run on both diesel fuel and liquefied natural gas (LNG), meaning it can meet increasingly stringent environmental regulations and take advantage of the current low prices of natural gas. “This state-of-the-art vessel is key to our efforts to secure a safe, cost-efficient and reliable supply of ethane for Borealis operations over the long term,” states Markku Korvenranta, Borealis Executive Vice President Base Chemicals. “We are pleased to have gained such an experienced partner with Navigator Gas. This project and the related investments underline our commitment to further strengthen our monomer position in Europe." In the meantime, the currently ongoing, multi-million investment in the cracker upgrade and the construction of an ethane storage tank in Borealis’ location in Stenungsund is proceeding according to plan. The commissioning of a new unloading and storage facility will begin in the fourth quarter of 2016.